It was another hot sunny day (31 C). We were on Lock Street in Hamilton and managed to find a little bit of shade across from this church. I totally messed up the placement of the church on my canvas with the steeple dead centre and too much foreground. The steeple is very complicated and tough to sort out and paint. Especially with the thick paint that I like to use. It was a great learning experience so I consider it a good morning. I really do need to paint more buildings. Debbie and I spent a week on Manitoulin Island and I drove off the island to the Whitefish Falls area to paint. I love the La Cloche Mountains, the pine trees and the water. Together they make great subject matter for paintings. It is easy to see how members of the Group of Seven were inspired here. This was the first painting that I did. It is from Willisville Road and I believe the lake is called Strawberry Lake. The wonderful people at Bay Villa Lodge allowed me to wander their property at the mouth of the Whitefish Falls River. This is a scene from their island which wasn't really an island. This is a third painting done from an old railway bed just outside Whitefish Falls. It was about an hours drive and a fifteen minute hike. I arrived just in time to catch the last of the colour from the sunrise but I think that it was worth the trip. I don't often paint the same motif twice but when I got to La Salle marina, to meet friends to paint today, I discovered that the sailboat was turned to show its bow and the bright clear day totally changed the look of the steel company. I also saw it as a chance to correct some composition problems with the first try. This was also my first time painting on a coloured ground. I like the results and will likely continue to colour my boards before I paint on them. We are off to Manitoulin Island tomorrow and I think that the coloured boards will be a big help there. 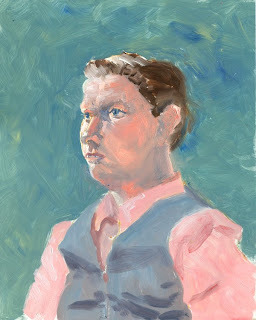 Brandon - oil on hardboard 14" X 11"
I was painting with the Burlington Fine Art Association Wednesday morning sketch group. They alternate weekly between portrait, figure and still life sketching. The model this week was Brandon. He had fantastic colouring which was accentuated by the pink shirt and he sat remarkably still. This was only my third portrait in oils and my first using oils with a live model. I am really excited about this painting. It isn't perfect but it was done in under two hours and I am very happy with most of it. 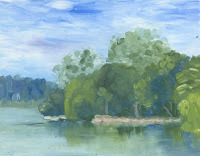 This is one of two paintings that I painted standing on the deck of the gazebo near the boat launch. I was a great but somewhat busy place to paint. I no longer have a problem with spectators so this was a wonderful day. It was warm and still but comfortably so. I am not posting the second painting because it is already painted over. Sometimes it just doesn't work and the harder that I try to fix it the worse it gets. It was a learning experience.